This dream was from 7th January 1991 and the imagery stayed with me all of that day. The entire dream was coherent. It was as though I was riding round in someone else's head and had limited access to their knowledge (e.g. I knew may way around and where certain doors led to), but could not influence their actions. I was purely a passenger, looking out through their eyes. I refer to that person as the host. My "host" evidently felt a lot of the scenery and events to be completely mundane even though I wanted to spend more time investigating things which were extremely novel to me. The dream did not contain any of the scene shifts or incongruities found in ordinary dreams Even stranger, I woke up, went to visit the bathroom and returned to the dream with only a short lapse in my host's time. On reviewing this in October 1995, I still had the feeling that it was not a simple dream, but more like a time-slip experience where I had tuned into the mind of someone in the future. A friend suggested it was the memory of a previous life which I had already lived in a future time-frame and that time was not linear. I recall so much of it as though it was a real-life event - a past life lived in a future time. I am in a corridor on a deck of what is evidently a space vessel. By the look of it, it is one that undertakes long journeys or at least it spends a lot of time in space. Everything still looks very new, white and gleaming and a bit like an ultra-modern shopping mall. I am standing in a triangular plaza. At each of the three corners are sets of escalators leading to and from the level above. There is a corridor leading off one side of the triangle and the triangular plaza has some seats, all covered in blue fabric. I have to draw this to give an idea of the layout. At this point I am still very much myself in the dream, with none of the dream insights which I normally get with a dream (that "dream logic" feeling that everything makes sense, however bizarre it really is). Most dreams provide me with some sort of accompanying knowledge so that even the strangest things seem normal, but at this moment I have none of that inside knowledge while standing in the plaza. I am a stranger exploring a new place. I am exploring the corridor by one set of escalators. Although I have no insights into this dream-scenario and I don't know where I am heading (or why I am heading there) I am not lost. I feel as though I am a passenger in somebody else's mind seeing what they are seeing. Because of what they are doing, I am getting a sort of tour of this part of the space vessel, but cannot dictate where I want to go - I am "carried" about by this other person, looking at things through their eyes. I now realise that I have some sort of access to their "surface knowledge" - I can look at things and know what they are, and I feel that I know where I am going, but still none of the "deeper knowledge", no underlying knowledge and no sense of questioning anything that I saw, merely accepting that it was as it should be - no scene shifts, incongruities or bizarre actions. I have a rudimentary knowledge, but no real understanding. I keep saying " do this" and "I do that", but it is my host who is doing these things and I can't influence her actions. Along the corridor are several rooms with chairs and tables in. The first thing that springs to mind is a corridor with class rooms or offices. My host looks into one of the rooms. One side of the room is a huge clear panel (it felt like a window rather than a screen, but I cannot be sure) looking out into space. The data in my host's mind tells me that these are viewing rooms where people can come and sit. At present these rooms are empty. Further along the corridor are closed white doors. Everything - the walls, floor, doors etc - is white or grey white. It is also clean! According to my host's thoughts, one set of escalators (diagram, lower right corner of triangle) leads to a wide corridor area, reminiscent of a shopping mall. Perhaps it is the on-board shopping or some sort of gallery to keep passengers entertained. My own mind tells me that if this is a space liner then it must have the same sort of facilities you would find on a cruise ship. There are large glass cases in the middle, displaying items, but I can't remember what, possibly clothing though my host wasn't paying any attention so I didn't get a good look. That wide corridor is lit by small, bright spotlight bulbs inset in the ceiling (I cannot tell how the other corridor/plaza were lit, the lighting seemed to be all around and not from discrete sources). There are also benches up there as well as displays. My host recalls sitting down on one of the benches. My host is looking for the Ladies toilets. 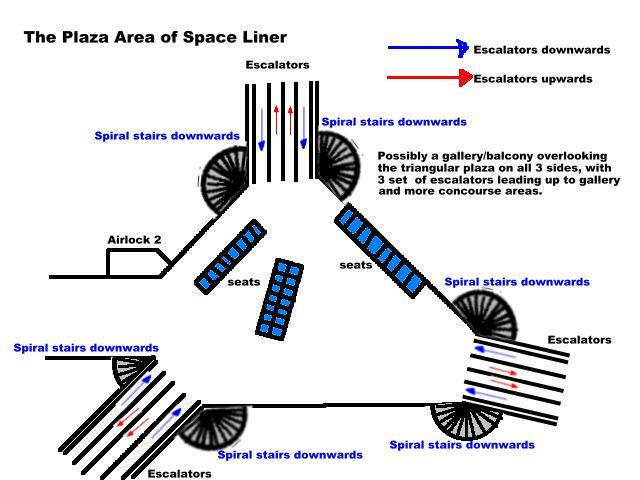 They are at the top of the escalators (diagram, top centre of triangle). My host does not have time to look around the upper area (the thoughts in her mind tell me that she has been told to be at Airlock 2 at 1.18, the thoughts are very specific about the time), so she goes straight to the toilets which are very close to the top of the escalator and on the right hand side. There are other women in their, some are fixing their make-up as though about to go on a trip or meet someone. My own mind, inside this host, wants me to look at the make-up styles and clothing fashions. I see blue nail polish and silver eye shadow (applied thickly), but my host isn't noticing these things and goes straight into a cubicle. I exit the Ladies toilets and go back down the escalator. Airlock 2 is on the junction of the triangular plaza and the corridor where I saw the viewing rooms. There are large double doors which are open so that people can go into the airlock or whatever (in retrospect it was possibly some sort of shuttle docking area). A uniformed stewardess takes a group of us through the airlock. The doors lead into a short corridor. The gravity seems to be less than in the plaza, so that I feel lighter or buoyant as though in water but without the thick resisting nature of liquid. My own mind suggests that this could be an awkward environment to work in long-term. My host briefly notices that the stewardess has velcro-soled slipper-type shoes. The corridor is dark, with more subdued lighting, but it is not grimy, just dimmer than the plaza. It is a boarding corridor to a shuttlecraft. As we board the shuttle, we have to show the stewardess some sort of ID folder which acts as a passport or boarding ticket. My own mind really wants to look at this document and see who the host is and also the date! Infuriatingly, my host does not bother to look at hers, I get the distinct impression of a photograph in the folder, but I get no chance to read the details. I get the feeling that this is so mundane, that my host doesn't pay much attention to her ID folder. I definitely feel that I am riding about in someone else's head and witnessing what they experience through their eyes. It reinforces the feeling that I can take in what I see through their eyes, but not influence their actions - just a passenger in their brain. I notice a couple boarding with me, the woman has a brown leather-type jacket. It feels awkward moving in low gravity. It should feel light and airy, but I just feel cumbersome as it is impossible to aim for somewhere without overshooting. No wonder the stewardess wears sticky soles - she has to walk about in this much more than we do. Passengers must strap themselves into forward facing seats (red, interior seems mainly a dark red/rust/ochre colour in this passenger area, lighting is more subdued than in the plaza) as the shuttle will be without gravity until it leaves the gravity field of the "Galactic/Interstellar" (data from my host's mind) class ship we are leaving. 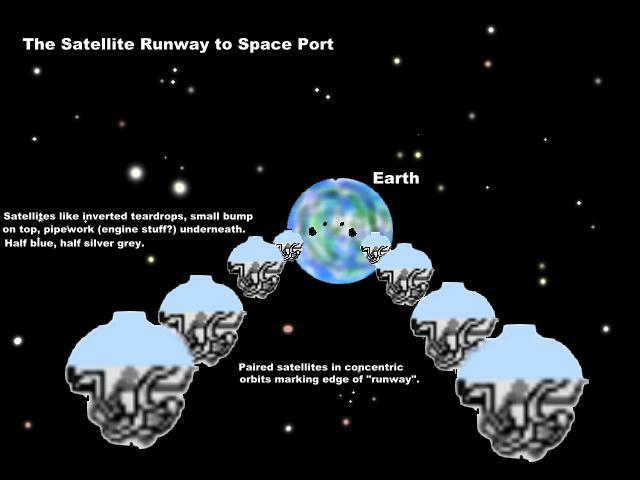 The shuttle will take us to Earth, it can land on a planet while the other ship is too big and must remain spaceborne. At this point I feel that the big ship is in Earth's solar system, probably beyond the planet Mars (at least). My own mind tells me that the trip from Mars to Earth is close to 6 months, but my host's mind acts like it isn't much more than a plane flight is for me. After casting off into space the low gravity is switched on. We are invited to go to our sleeping quarters. The journey is not very interesting (not to my host anyway). Presumably it was not safe to go to sleeping quarters during take off (may like aircraft we must have seats in upright position during take-off and landing). The sleeping quarters are like the Japanese capsule hotels - sort of coffin-like shelves with hatchway doors (hexagonal, dark grey or black, I think) stacked in tiers on the wall. Inside the capsule is grey/blue with a cushioned bed area. Some people want to stay in their seats, but my host is opting for some sleep. Again this is irritating, because there is so much to investigate and she acts as though it is an everyday event. Maybe it is everyday for her! The markers remind me of silver and blue baubles or buoys, like upside-down teardrops with some sort of knob at the top. There and bottom halves are different colours, but I cannot remember which half was blue and which silver. There is a lot of visible pipework on the lower section of each buoy and each one is half the size of this shuttle craft. (My friend suggested that the pipework was to do with engines which stopped the markers' orbits from decaying.) My host pays attention to the lower part with the pipework; I think they look like pipes in a heating system of factory. The shuttle is due to land in the US at a space terminal (spaceport) located at "Shakers Valley". I got only sketchy details of the spaceport, from my host's memories I think as I do not remember the landing or disembarkation - it seemed much like an airport, possibly less busy (or my host's memories were of an off-peak time?). I wonder if Shakers Valley is a real place that exists today and whether I can locate it on a map. At that point the dream began to break up and I drifted into ordinary dreams (shifting scenes, meaningless things etc). However, for most of the night I felt that I'd been inside someone else's mind travelling with them. The entire dream had been coherent, my "host" evidently felt certain parts of it to be mundane and I was merely a passenger. I can still recall some parts of it as though it was a real-life event - a past life lived in a future time.